Powai Durga Puja Pandal 2011 (PBWA Durga Puja in Mumbai) is coming up with innovative theme of replica of Sripuram Golden temple, Tamil Nadu. Organized by Powai Bengali Welfare Association, this year’s Powai Sarvajanin Durgotsav is entering into 6th Durga Puja festival. The puja will be opened for common devotees from 30th September to 6th October, 2011. The venue for this Durga puja pandal is Hiranandani Gardens, behind Bus Depot Ground at Jalvayu Vihar, Powai. 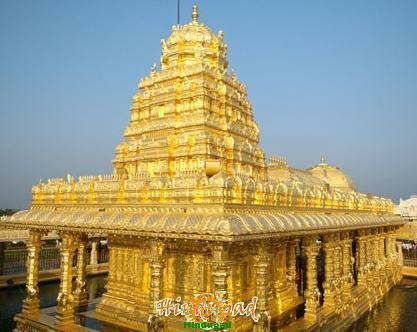 Theme of 2011 Puja, replica of Golden Temple of Sripuram is estimated at a budget of approximately 1 crore rupees. Apart from the splendid theme, the puja committee is also making arrangements to telecast all the cultural events at the puja stage live through live streaming. Renowned singers and artists will perform live at the venue of Powai Durga Puja. The popular dance drama ‘Balmiki Pratibha’ will be staged on 2nd October (Maha Sashthi). Devotees can also witness special performances of singers Rupankar, Monali Thakur and Babul Suprio on 3, 4 and 5th October 2011 (Saptami, Ashtami and Navami).